May 2008 was a watershed month for 5031 - it emerged from two months at Busworks in Blackpool with a full repaint as well as many other detail jobs completed. It is seen here the day after its return south at the Bristol Centenary rally at the Harbourside complex. 5031 returned to the West Country for the first time in nearly twenty years in March 2007. The bus was taxed for the first time since 1998 and restoration was well under way by this time. Your author received a phone call in April 1998 from Mark Bennett to say that 5031 was at the bus graveyard in Carlton and was in danger of being broken up later that week. What else could he do than go up and rescue his favourite VR? Seen here having just been pulled out of the scrap line at Alan Hardwick's yard, it is in the final overall advertising livery carried during its time with AA Trans Alv. 5031 was quite a survivor after its sale by Midland Red West. Passing through several owners it ended up with AA Trans Alv near Derby who painted it in this overall livery for a local nightclub. 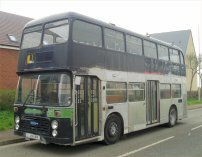 It remained the only VR in this fleet for nearly six years, apparently becoming something of a local celebrity itself with clubbers in Derby. 5031 was repainted in City Line livery immediately prior to transfer to Midland Red West. 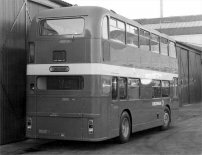 It is seen in Redditch in June 1988 with MRW logos at the front and rear corner. 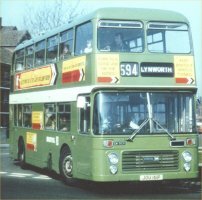 5031 was the last vehicle in NBC green livery operating in the City of Bristol. It is seen here at The Centre with Cityline fleetname in early 1987, just prior to repaint out of these colours. 5031 carries copious advertising for Bristol Omnibus's Faresaver tickets in this early 1980s view. 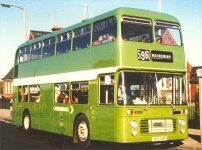 Seen soon after entering service, 5031 was one of the first vehicles delivered to Cheltenham District in NBC green livery, earlier deliveries having carried red livery. This rare view shows 5031 before entering service, parked up at Lawrence Hill in Bristol. Of particular note is the rear route number blind which was painted over before entering service in Cheltenham. Later the aperture was removed permanently with new panels.